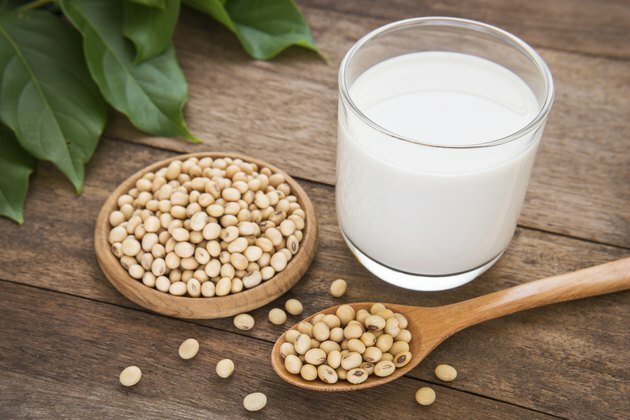 Soy milk has a limited lifespan, and once it goes bad the texture and taste are unappetizing. Accidentally drinking or mixing the spoiled milk into a dish is sure to ruin your appetite. Soy milk is sold in both unrefrigerated and refrigerated varieties, but both require refrigeration once the container is opened. Identifying whether the soy milk is bad is not difficult; there are a few key indicators in terms of smell and appearance to look for. Find the "best by" date printed on the outside of most soy milk containers. As long as the carton is not opened, the soy milk should stay fresh until this date. Mark the outside of the container with the date you opened the soy milk container. Many soy milk containers have an instruction printed on the label that explains to drink the soy milk within five to 10 days after opening the container. Smell the soy milk. It should have a mild smell. Strong, unappealing odors signify the soy milk is bad. Pour out some of the soy milk and examine the texture. Fresh soy milk is smooth, but spoiled soy milk might turn lumpy, similar to when cow's milk curdles. Store soy milk in the refrigerator in the coldest section away from the door. Some soy milk is sold in cartons that require no refrigeration until they are opened. Store these cartons in a pantry away from heat and sunlight until you open the container.